This Module displays a username and password Login form. It also displays a link to retrieve a forgotten password. If User registration is enabled in the User Settings of the Global Configuration screen, then the link "Create an Account" will be shown to invite Users to self-register. Pre-text. Optional text or HTML to display above the login form. Post-text. 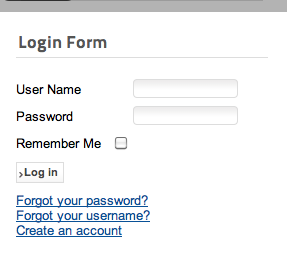 Optional text or HTML to display below the login form. Login Redirection Page. The page to load after a successful login. Select from the drop-down list box. If no page is selected, the home page will be used. Logout Redirection Page. The page to load after a successful logout. Select from the drop-down list box. If no page is selected, the home page will be used. Show Greeting. Whether or not to show the simple greeting text, for example, "Hi Administrator". Name/Username. Whether to use the user's Name or Username in the simple greeting. Encrypt Login Form. Whether or not to encrypt the login form using SSL. Do not enable this option if Joomla! is not accessible using the "https://" prefix. No tips have been added at this time. This page was last modified on 22 May 2011, at 09:42.